How Do 2015’s Mortgage Statistics Compare to Previous Years? With 2015 now officially in the books, we wanted to look back on the year in mortgages and see just how it stacks up to the last few. We pulled Marksman mortgage data to look at some of the bigger mortgage points to see how they compare. After seeing a steady increase from 2012 to 2014, the average rate for the year dropped substantially over the last 12 months, dropping not just below 2014’s, but 2013’s average as well. However, with the Fed’s recent announcement of a rate hike at the end of the year, the odds are that this lowered average rate likely won’t last into 2016. 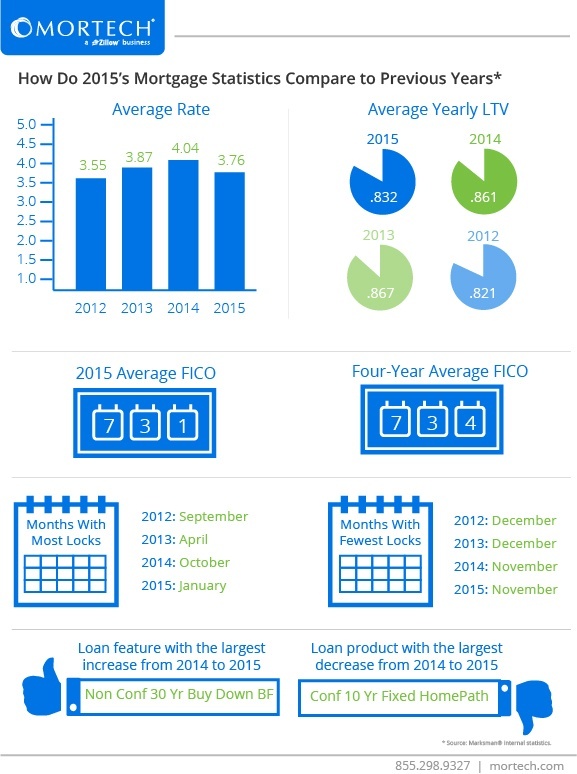 Like the average rate, LTV also saw a lower 2015 average than the past two years. The percentage of refinances that went into that number were incredibly similar to 2013 (52% refi to 53% refi), although the actual average ended up being much close to 2012, which had a 68% refi rate. 2015 did see a slightly lower FICO score than the four-year average, however the change was fairly small, and didn’t do much to change the overall landscape of mortgages in 2015. Variance in the month with the most locks continued again this year, as it was January that saw the most locks in 2015. This fact is more interesting when compared to the fact that November was, for the second year in a row, the month with the fewest locks. With November and December frequently having the fewest locks, it’s a bit of a surprise that January ended up being the peak month (a fact that can be attributed to record-low rates at the start of 2015). And finally, the loan feature with the largest increase in usage from last year to this was the Non-Conforming 30-Year Buy Down, while the product with the largest decrease from usage was the Conforming 10-Year Fixed HomePath. As Non-Conforming 30-Year loans have long been the dominant form of loan in mortgages, one such feature involved with that loan type increasing rapidly is hardly surprising. As we move into 2016, we’ll continue to monitor all of these things and see how the mortgage industry changes and evolves. We’ll also be providing our users with the best possible tools to handle and use these changes to generate more leads, streamline their workflow, and improve their business. To find out more about how you can gain access to all of those tools and features, contact us today for a short, free demo of Marksman.